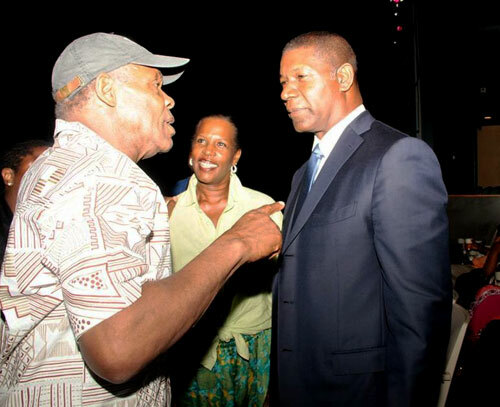 Dennis Haysbert (right), narrator of The Black Moses, is pictured at Bahamas International Film Festival (BIFF) with actors Danny Glover and Pamela Poitier. The Black Moses, a film on the life of the late Prime Minister Lynden Pindling, has its theatrical release in New York and Nassau on October 10. The documentary, written and directed by Bahamian Travolta Cooper, will also show in several US cities, including Los Angeles and Atlanta. It stars American actor Dennis Haysbert as the narrator. The film includes interviews from well-known political figures such as Jesse Jackson and Thabo Mbeki. Cooper said he was interested in going beyond the local work of Lynden Pindling and delving into his work as a world statesman. The New York showing of The Black Moses is supported by the Bahamas Film Commission, a unit of the Ministry of Tourism. Bahamas Film Commissioner Craig Woods said the Commission was happy to support a talented filmmaker such as Cooper. “He has come to us with a lot of skills that he honed in New York and Miami and of course Los Angeles, where he studied with some of the best filmmakers in the business,” Woods said. Woods said his office helped to promote The Black Moses in New York. The Film Commission also secured invitations to the premiere for Bahamians in the New York and surrounding area.